Vision Therapy was a Life Changer for My Daughter. How a tiny two and one half year old learned to fly like Superman! “Dr. Eryou quickly helped us to understand that our daughter had retained her primitive reflexes and that integrating these reflexes would not only help to improve her physical development, but her experience as a learner in the classroom and beyond. They were very clear about the next steps that we needed to take – a series of exercises which, practiced with consistency, would help her move on to the next stage of her development. Maxine is a fantastic therapist who is both knowledgeable and caring. She provided a warm and caring atmosphere for my daughter. I am happy to say that with a few months of work, we were able to get our daughter to where she should be for her age – we look forward to staying on top of this with them. I highly recommend this practice.” ~ R.J. 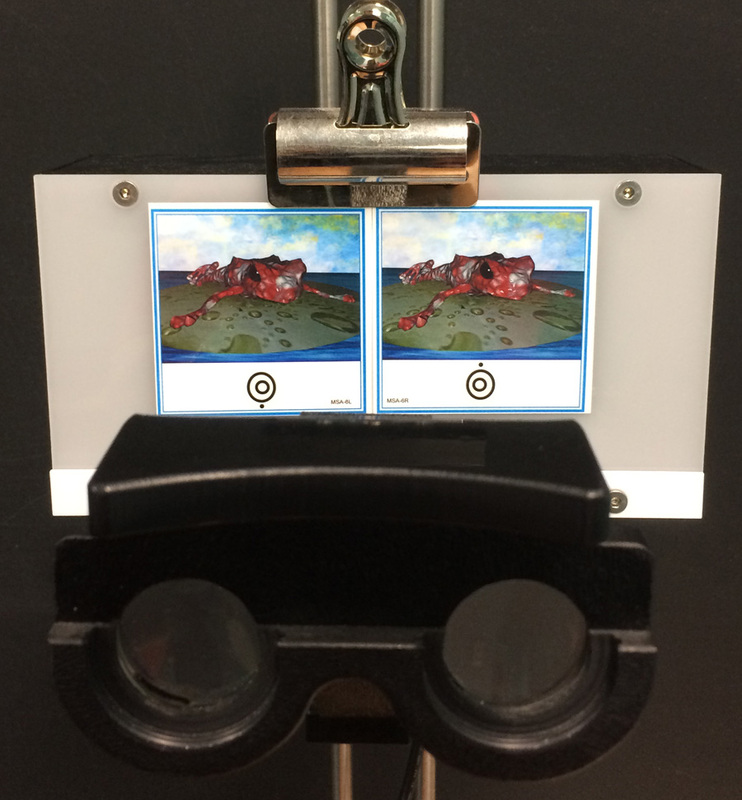 Vision Therapy is fun – and changed how I see the world in the most positive way! Most of the time you hear about how vision gets worse when aging. For me in my thirties, it was so far the other way round, and after 5 months I am super motivated to do anything to continue that journey thanks to Toronto Vision Therapy. Born with cataracts, having had both lenses removed as a baby (aphakia), having strabismus, amblyopia, and nystagmus the way I saw was for me the normal one, knowing that others see more and in a different way. Due to always challenging my eyes (biking, skiing, not always sitting in the first row in school), good care of eye-doctors and optometrists, my vision improved, from about 20% as child, to 30 % when graduating high school, to more than 60% in my late thirties. Understanding more about the vision neural pathway helped me more to understand what I see and what I can’t see. Based on that, I got more and more curious about what would be possible. When moving temporarily to Canada, my optometrist from home (Europe) pointed me at the great work done in Canada on Vision Therapy. I reached out to Toronto Vision Therapy, and from the first moment it was a great collaboration and experience. After a detailed assessment, Dr. April Eryou explained to me the situation and possible pathway and what might be achieved. I started the process and every session was empowering and motivating. Working with the vision therapist, Maxine, was lots of fun and I experienced many small steps how my vision improved by strengthening muscles and “reprogramming” how brain processes the input from my eyes. Knowing that every percentage my vision gets better impacts my future life, I made the daily Vision Training a priority in my life. Calming down the nystagmus increased the distance I am able to read. Increasing the peripheral awareness brought many “wow effects” and confidence in traffic. Looking out of the window, the trees appear clearer and more impressive than ever before. Facing the person talking to more directly, helped in social settings. Wearing red and green glasses during the training, looking at a ceiling light became an daily experience perceiving my own body, staring at a sticky note winking left and right eye and suddenly being able to keep the image still showed me that there might be the chance to focus on a target with both eyes at the same time. Trying out different colour filters (Syntonics), I experience how my brain is working hard on the new impressions it is challenged with. But each single small result is motivating to continue and in particular also to learn, understand and perceive how I am seeing. Dr. Eryou has an incredible knowledge and applies the latest knowledge in this field, connecting to other experts, aiming to achieve the best results. Leaving Canada, I know that my Vision Therapy journey will continue. Experiencing that I can reprogram my brain in how I see, empowers me to take other challenges in my life. I know, that I have to do the training, but the Dr. Eryou and Maxine gave me the best exercises, tools, feedback and motivation. Like this, every minute I spend on Vision Therapy positively changes the way how I see and perceive the world in many ways. I have a 10-year old son name Ryan that struggled with schoolwork since he started. He couldn’t settle down while doing his homework, he always wrote diagonally on a line and his sentences seems to be one big cluster of words. These were just some of his problems until I found out that he has vision problems beyond his 20-20 vision. Apparently, he needed Vision Therapy to enhance his ocular motor and perception skills. I went to Toronto Vision Therapy and Optometry for an assessment and the staff there were very friendly, helpful and great to work with. April and Maxine explained everything that was wrong with my son’s ocular state and recommended the required treatment for it. Vision therapy was the solution to my son’s ocular problems. It consisted of daily exercises that were easy, fun and required a minimal amount of time. 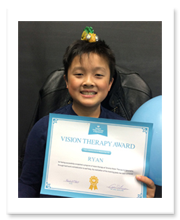 At first, Ryan didn’t enjoy the fact that he had more ‘homework’ everyday but as he completed more and more of these eye exercises, he actually enjoyed it and he looked forward to doing his vision therapy homework. Best of all, it made our family bond even stronger and now I don’t have to hover over Ryan and tell him to write straight on the line. The outcome was great. Ryan can now finally sit still and concentrate on his work without over-stressing his vision. Overall, both Ryan and I had a great experience at Toronto Vision Therapy and Optometry and I recommend anybody who needs this treatment to enroll. ~ G.P. “Vision Therapy is probably the best thing I have agreed to do in my life”. I have a condition called amblyopia, also known as Lazy Eye. It’s a development disorder where an eye doesn’t develop to its full capacity while the other eye does and occurs around infancy and childhood. When I was around 5-6 years old, I noticed this when I closed my right eye and noticed that I didn’t see as well in the left. I told my parents but they thought it was just something in my eye. I don’t blame them at all because I was just a 5 year old, so they probably didn’t think it was anything to serious. Fast forward a couple of years when I was 12. I told my parents this again so they decided to take me to my doctor. He said I most likely have Amblyopia, and recommended an eye doctor to see. We went to a man (whose name I won’t mention) he confirmed that I had amblyopia. We asked about anything we could do to help fix this problem. This is probably the worst part. He said straight up, that there was nothing i could do, and I just need to deal with it for the rest of my life. This was really annoying to hear from a doctor and really upset my parents who thought it was their fault. I was also upset at this, but luckily my parents did not give up on helping me. We went to many other doctors who all told us that i could fix the problem in time, with a lot of practice of using the eye. One of my doctors said that I should go to vision therapy. I was very skeptical at first, but agreed to go. It was horrible at first because in order to go, I learned that I needed to use contact lenses instead of just glasses which horrified me at the time. So over the course of about 2 weeks I learned to wear contacts which I can put on easily now, and I think I like them better than glasses. Fast forward again another few months and I was at Toronto Vision Therapy on my first session. I did a few exercises and it wasn’t as bad as I thought it was, until a few weeks in, I did an exercise that changed the way I saw. The exercise involved me staring into a device which used both of my eyes to work together to look at a picture. At first it was hard to get my eyes to work together, but then I could do it in a matter of seconds! That was when I first realized I saw, in 3D. The way that the pictures looked where so amazing! One that stood out a lot was a red frog whose legs felt like they were sticking out and i felt as if i could just reach out and touch it! It was just a really amazing experience! Now whenever I do the exercise my eyes have learned to work together instantly! I’m still doing vision therapy, and will be for a while, but I’d say that it was all worth doing. My eye might never be perfect, but even if it won’t be, I’ll strive to get it as good as it can be, and prove to that first doctor that I did it. ~ H.P. John’s Journey | Vision is learned and can be worked on and improved. There were visual skills I had not yet mastered (e.g. 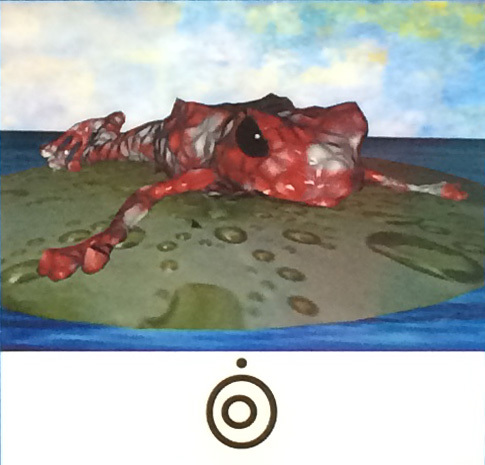 horizontal eye tracking, looking softly). Vision is learned and can be worked on and improved. My visual system is delicate in nature (If I am tired or anxious, my visual system becomes significantly impaired). My anxiety, my visual processing difficulties and the lack of confidence in my visual system exacerbated one another. My anxiety, my visual system and my confidence are under my control. April and Maxine are excellent facilitators of the vision therapy process and truly care about their patients. Hi, I’m Curtis. In the beginning, I didn’t know there was a problem with my vision until my last check up. Little did I know I had a convergence disorder. At first, I was curious of how they can fix such a problem. They gave me a few tips on how I might be able to cure this disorder by doing pencil push-ups, just to see how big of the issue my condition was. As weeks moved on, pencil push-ups weren’t enough and, therefore, we proceed with the Vision therapy. In the first week of Vision Therapy, I was very nervous because I wasn’t sure if I were capable of performing the task correctly. But as weeks pass by, I started to feel more comfortable. Every single week, my instructor Maxine was always positive to see me. Knowing that, it felt good inside in me every week. The exercises were full of fun if you tried your best. However some of them were a bit difficult to do, but nothing is impossible to do. Maxine has made the exercise fun by showing me different ways of doing the task, pictures and much more. Maxine was very supportive not only of my condition but my personal life as well. The one exercise I liked the most was the ones with the touchscreen television. Not only you get to work with technology as well, you also get to make it even harder and to your standers, eg: putting “super rabbit” on your head to keep good posture. I liked how they provide you materials base on your likings eg: if you’re interested in animals, they would provide text for you to read about animals instead of subjects your not so interested about. Toronto Vision Therapy really helped me not only with my condition but with my other lack of skills, such as my lack of confidence. What I liked about the place is that it’s an open area, where you can just talk about anything you want. The instructors and doctors are really positive and want you to do the best by not fully pushing you but telling you that you can do anything. Maxine has shown me that anything is possible if you try first. You may not succeed the first time but as you practice and practice it gets better later on.